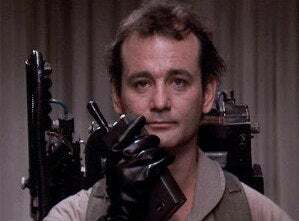 Bill Murray: I Am Evil Venkman? Only if I can play an evil person. No, it's all about the script. It's not like I have an obligation to the franchise or anyone. If the script were good and I thought we were going to do it. No one's ever talked about doing the third one because the second one was the way that it was. When I poked and prodded more to see what kind of man Murray thinks Venkman is now (is he divorced, does he have kids, what about the show?) he replied sweetly and ever so roundaboutly. I am Venkman, so here I am. As far as the movie goes. Let's see what these fellows come up with. I don't want to program them, I'm sure I couldn't. Let's get a new take on it. In the sequel there was Venkman and he was sort of not really the father of the kid of his old girlfriend. Like "who invented that one," that's not the way I think. That serves the special effects writers. But as we all now know the taste of slime from Ghostbusters 2 left a stank taste in Murray's mouth. But he's singing the praises of the The Office scribes that are taking on this flick. I think it's a great idea that they hired these two guys to do it. Because I think it could be a fresh look at it and it could be funny. When we did the sequel it was rather unsatisfying for me, because the first one to me was the goods. It was the real thing. The sequel, it was a few years later [and] there was an idea pitched. They got us all together in a room and we all just laughed for a couple of hours and thought up a few ideas. So we had this idea. But it didn't turn out to be that idea, when I arrived on set. It was a whole different movie. And the special effects guys got their hands on it. It was just not the same movie. There were a few great scenes in it but it was never the same movie. So there was never any interest in a third Ghostbusters because the second one was so disappointing for me at heart. The third one could happen. Oh to be a fly on the wall in that room when all the original Ghostbusters were pitching ideas for the sequel. But until then you'll have to get your Murray fill from the underground steampunky village of The City of Ember in theaters on Friday October 10th.